The first part of a new series of articles centered around football's one-club men, the career of Jamie Carragher is no stranger to controversy, triumph and determination. The line of Liverpool legends is long. With the likes of St John, Callaghan, Dalglish, Rush and Gerrard all taking their place in Anfield folklore. However, Sunday (19/05/13) marks the end of the career of one of the Merseyside club's current crop of historical figures. After making an immense 736 appearances for the Red's between the years 1996-2013, "Carra" is closing the curtains on his glittering career. A cornerstone for the 2005 Champions League victory and a defensive linchpin in no more than fifteen domestic and European finals, winning twelve, the name Jamie Carragher is to always be remembered fondly by Liverpool fans. It is rare in the modern game to find a "one-club man" with the whole notion beginning to become something of a myth. The list of recent players consists of the likes of Giggs, Scholes and Maldini. He's the epitome of a loyal dedicated player who Liverpool have been lucky to have for more than a decade"
Carragher's early career began at the Lilleshall academy in Shropshire, England. Already on the Liverpool books from a junior age, Carragher joined England's youthful prestige at the Lilleshall, which in previous years had produced the talents of Sol Campbell and Andrew Cole. Clearly having the potential to succeed the Liverpool youngster would go from strength-to-strength, with the odd hiccup along the way. 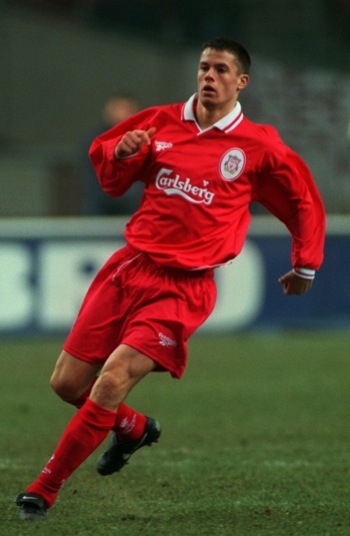 Carra's first silverware was not a major trophy but the FA Youth Cup alongside best friend Michael Owen. Carragher himself being a defensive midfielder a position not currently associated with Liverpool's number 23. His first full appearance would shortly follow in a League Cup tie against Middlesbrough, before playing and scoring against Villa on his Premier League debut. 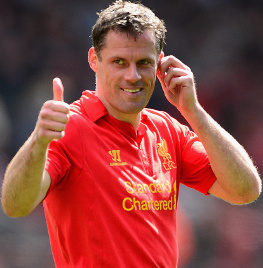 An early goal for Carra but one of only 5 in his career! "For me, he will go down as one of the top five. If you talk about how long he has played for Liverpool and what he won there and what type of player he was, he will go down in history as one of the greatest in the history of the league." Things did not run as smoothly for Jamie internationally, despite earning his first cap in 1999 against Hungary. After this Carragher would go on to earn 37 more, a credible tally but surely not representative of his talent and club performance for Liverpool. After featuring at Euro 2004 and World Cup 2006 he called time on international football in 2007 due to considering club football more important (something many agree with) and the fact players like Ledley King and Wes Brown controversially starting ahead of him. 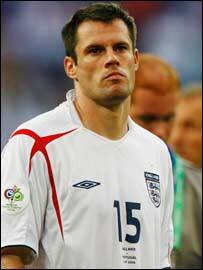 In a change of heart Carra went on to play in the 2010 World Cup in South Africa after being asked by Fabio Capello, a manager Carragher had great respect for. For me there are many moments of Carragher's career which stand out, none more so than the Champions League Final of 2005. Prior to the 2004-5 season Liverpool had been under the tenure of Gerard Houllier, a manager who led the Reds to 6 major trophies between 2001-3. Carragher had played a part in them all, surprisingly however, as a left-back due to the dominance of Sami Hyypia and his Swiss counterpart Stephane Henchoz. "He started playing at Liverpool as a defensive midfield player but wherever you played him you got 100 per cent, even more. He was a true leader." Arguably it was the introduction of Rafael Benitez to the Liverpool hotseat in June 2004 which changed Carragher's career for the better. Benitez decided to change Carra's position to the centre of defence after a previous encounter against the Reds whilst managing Valencia. "We had a lot of reports and we knew he could maybe be better as a centre-back, because of his techniques, his physical condition and because of his reading of the game." According to Carragher himself, the Benitez influence shouldn't go unnoticed on his overall performance. May 25th, Ataturk Stadium, Istanbul - The date and venue of Carragher's greatest achievement and arguably most inspired performance. After conceding three first half goals to a ruthless AC Milan side, the Champions League dream seemed to be in tatters for Carra. However after an unbelievable turnaround Liverpool leveled the game to 3-3 before full-time. Many often mention that Steven Gerrard was the main man in changing Liverpool's fortunes but Carragher's display was nothing less than heroic. Despite suffering immense cramp, Carra would help Liverpool to win the trophy for a 5th time after beating the Italian giants on penalties. "He's a wonderful player. At his peak for two or three seasons he was one of the best defenders in the world." Of course the Champions League final victory was not the only silverware won by the Liverpool defender. Carragher won a famous treble of the League Cup, FA Cup and UEFA Cup in 2001 under Gerard Houllier as well as adding another two League Cups, another FA Cup, multiple Super Cups and Community Shields. However, perhaps his biggest regret is never winning the Premier League title. In a recent interview Carragher noted his disappointment in not claiming Liverpool's 19th title. "I've never won the league, that's a disappointment...I wish I'd won the title, if you look at everyone there's always something somebody hasn't done. There's always more that could be achieved no matter what you've done." In the modern game it is rare to find a career without a few controversies or hiccups along the way. The autobiography, "Carra: My Autobiography" caused some controversy, especially when Carragher stated he purposely tried to injure Rigobert Song after the Cameroon international facially expressed his surprise when told Carragher received an England call up. Furthermore Carragher's friends were alleged to have looked to put the frighteners on Lucas Neill after he broke Carra's leg with an awful challenge in 2003. In a 2002 FA Cup tie versus Arsenal he also threw a coin back into the crowd after one was thrown at him. Carragher was sent off, but recognized it as a mistake, even comparing it to Luis Suarez's "childish" bite last month. It is the relationship between Jamie Carragher and Steven Gerrard which has been the spine of the Liverpool team in recent years. Not only due to their technical abilities but their scouse roots. In the modern game it is common to see a first XI with one or sometimes not a single member from Britain. This background is not only what has led the scouse pair to be idolized by Liverpool's fans. Over the past 16 years, Jamie Carragher has displayed determination, passion and sheer willingness to succeed. Will we ever see the likes of him at Anfield again? Who knows, but with the likes of Martin Kelly, Andre Wisdom and Conor Coady, the Carragher legacy has every chance of continuing! "His worth ethic is fantastic and he is, as you know, a very loyal person - loyal to his friends, loyal to his family, loyal to the fans, loyal to the club, which is something that's not very usual now." "We all dream of a team of Carraghers". -The Kop's musical salute to the Bootle-born local lad, Jamie. I loved him, he's a fantastic example for any young lad who wants to play the game. He's been a really, really good professional." "The memory that I have of him is someone who was loyal and committed. You will always remember him as a Liverpool player because that's the only team he played for."